Facing west across Portsmouth Square from Kearny Street in San Francisco, around 1866. Image courtesy of the Library of Congress, Lawrence & Houseworth Collection. 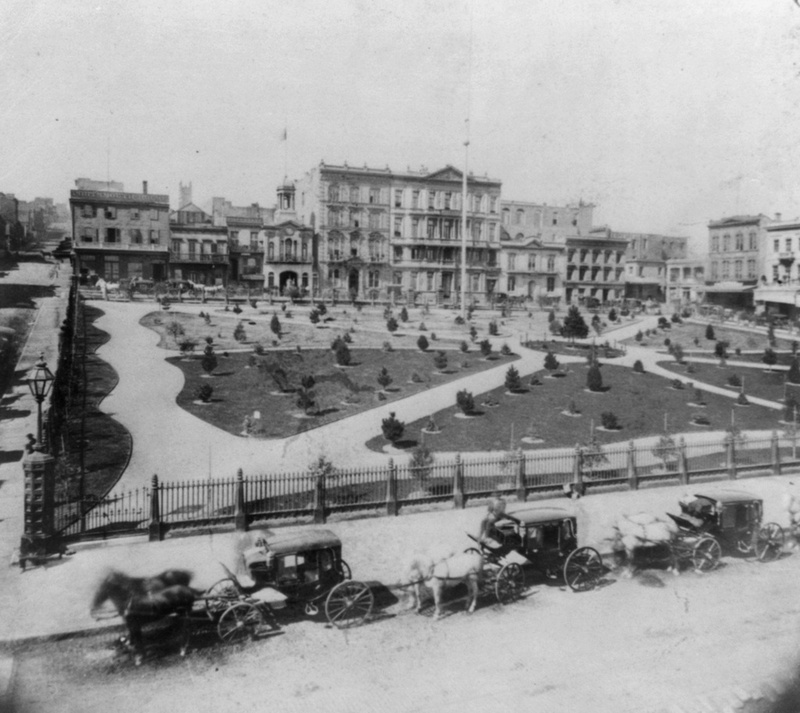 This earlier post shows Portsmouth Square in 1851, facing the north side of the square. Here, this first photo shows the west side of the square about 15 years later, after it had become a landscaped park. 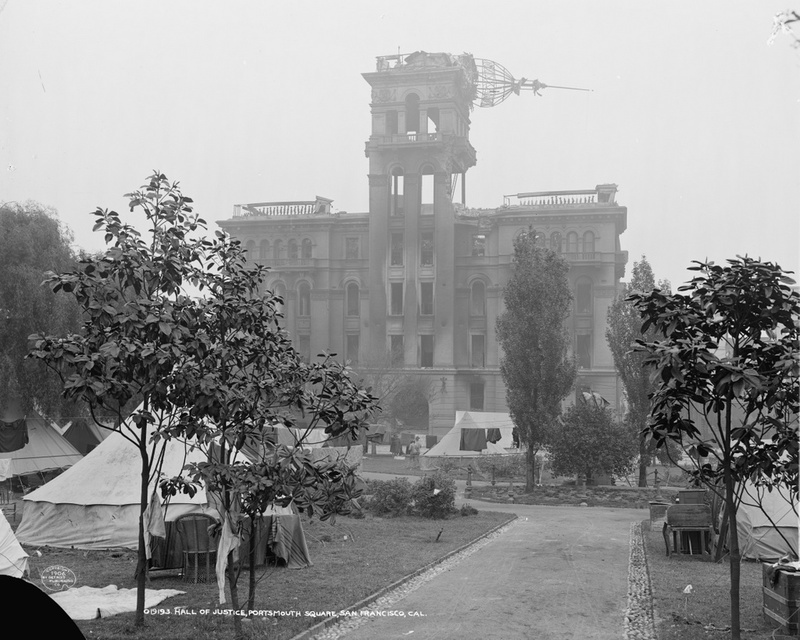 Anything from the first photo that was still standing 40 years later was destroyed in the 1906 earthquake; the photo in this earlier post shows the square, facing the opposite direction, in the aftermath of the disaster, when the square was covered in tents for displaced residents. 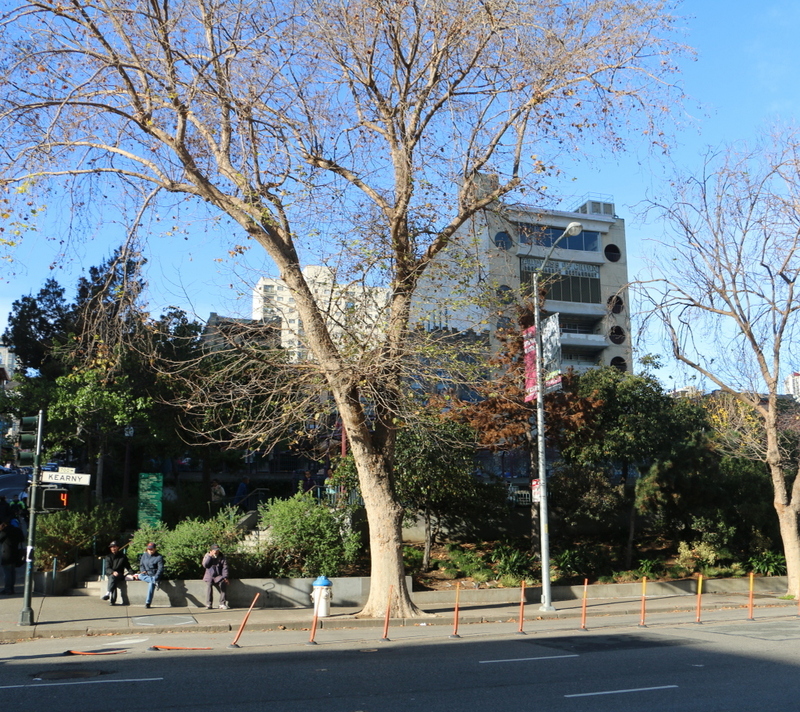 Today, nothing is left from the original photo except for the square itself, which is still a public park and is located within the city’s Chinatown neighborhood. 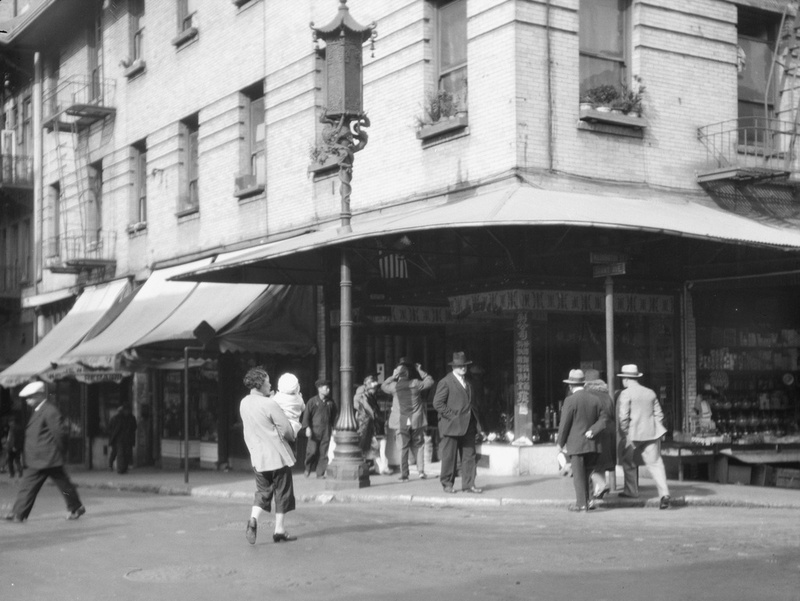 The corner of Jackson Street and Grant Avenue in San Francisco, around 1896-1906. Image courtesy of the Library of Congress, Arnold Genthe Collection. 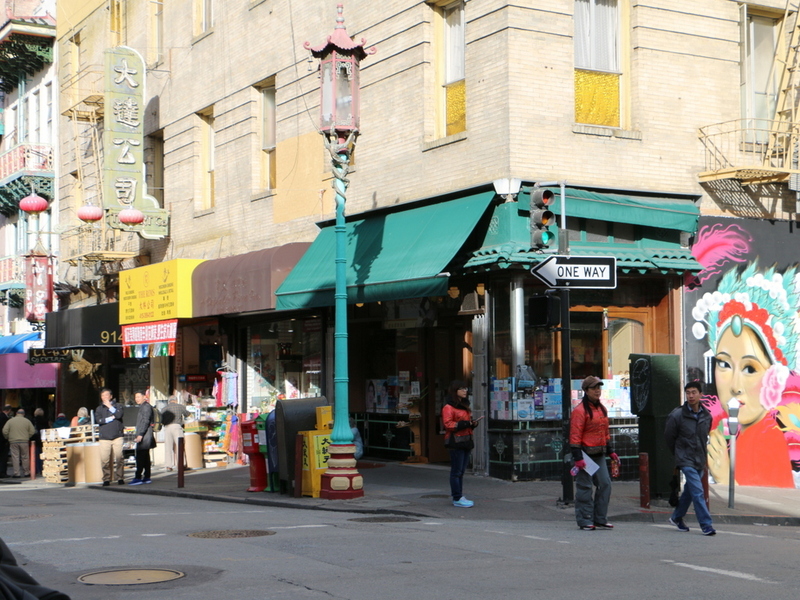 San Francisco’s Chinatown is the largest Chinese community in the world outside of Asia, and it was also America’s original Chinatown. Immigrants from China arrived here around the same time that almost everyone else did, during the Gold Rush of the late 1840s and early 1850s. 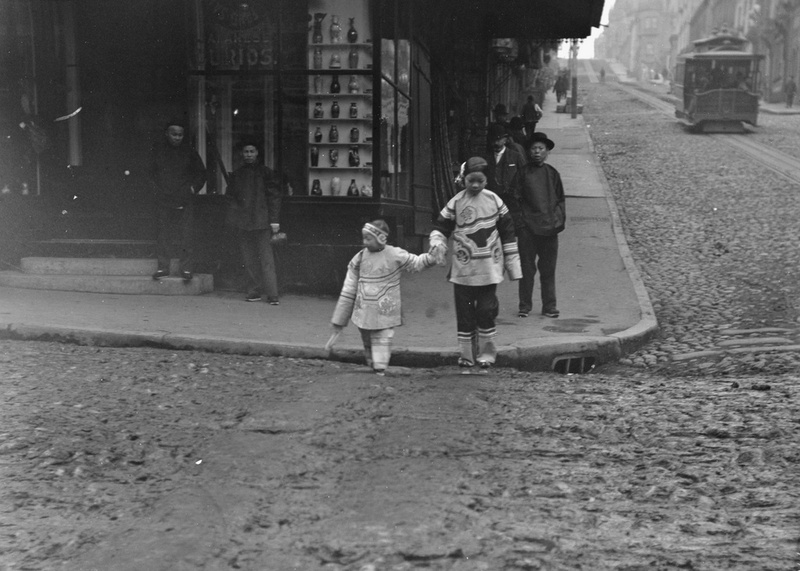 Later on, many other Chinese people came to find work on projects such as the Transcontinental Railroad, and this neighborhood became an ethnic enclave within the city. Photographer Arnold Genthe was primarily known for his portrait work, and his clients included many notable politicians, writers, and entertainers. In addition, he photographed the immediate aftermath of the 1906 earthquake, including the one in the previous post, but his works also included hundreds of photos of Chinatown that were taken beginning in the 1890s. His collection, which includes the first photo here, provides the only real glimpse into everyday life in Chinatown before the earthquake. 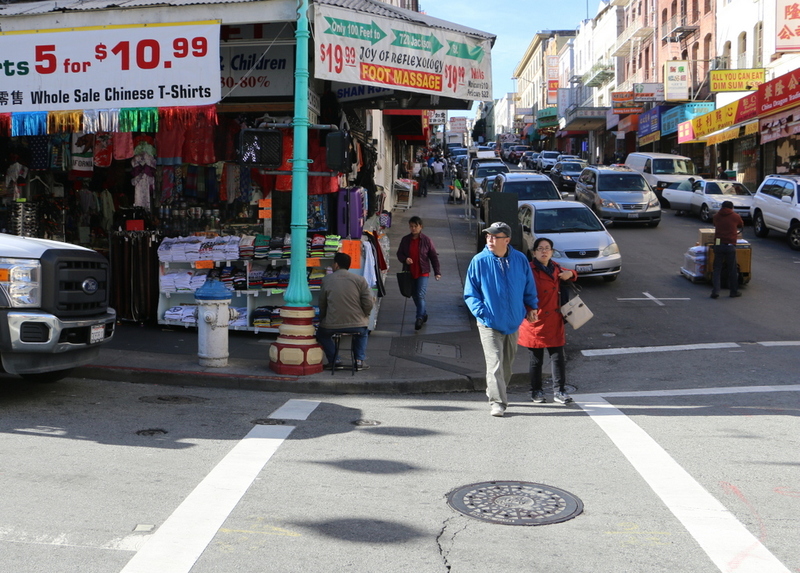 This scene, along with the rest of Chinatown, was completely destroyed in the earthquake, and some politicians sought to use the disaster to rebuild Chinatown further from the center of the city. However, the plans ultimately failed, and Chinatown was rebuilt here, where it continues to be a vibrant community as well as a popular tourist destination in the city. The Hall of Justice at Portsmouth Square in San Francisco, shortly after the April 18, 1906 earthquake. Image courtesy of the Library of Congress, Detroit Publishing Company Collection. When the 1906 earthquake hit San Francisco, the Hall of Justice building was just ten years old. Despite what the first photo shows, it actually survived the earthquake itself. 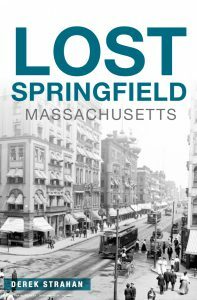 It had been seriously damaged, but neither the building nor the 77 prisoners housed on the upper floors were in any immediate danger. In fact, on the first day of the disaster the mayor made the Hall of Justice his temporary headquarters, since City Hall had been completely destroyed. However, the situation here soon deteriorated. The earthquake had started a number of fires throughout the city, and a series of poor decisions on the part of city officials allowed the fires to spread. One of the ill-fated tactics was to attempt to create firebreaks by destroying buildings. In most cases, though, this was counterproductive, because the explosives tended to do a better job of igniting the buildings rather than destroying them, which only exacerbated the problem. By nightfall on the first day, the fire was approaching Portsmouth Square, and the Hall of Justice was hastily evacuated. The prisoners were transported to another prison, and the bodies in the morgue and the police records were removed from the building and piled up in the middle of the square, covered in canvas. As the city burned around the square that night, two police officers guarded the pile. There was virtually no water available for firefighting, so the officers emptied bottles of beer onto the canvas to keep it damp, thus saving both the corpses and the records. 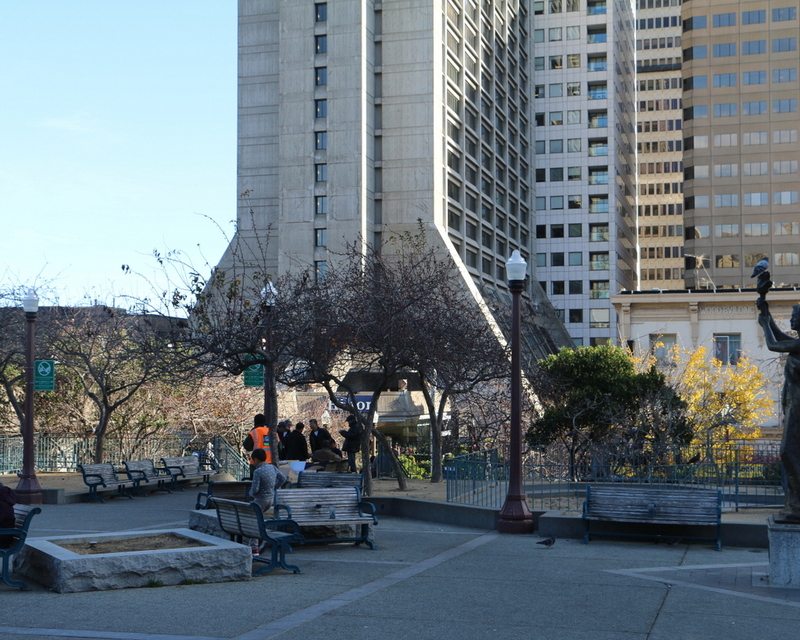 The first photo shows Portsmouth Square perhaps a week or so after the fire. By then the bodies and the police records had presumably been moved to a safer location, and the square was instead covered with tents of displaced residents. The burned-out remains of the Hall of Justice loom in the background, with the frame of the cupola dangling from the top of the building. It was beyond saving, and was demolished soon after. 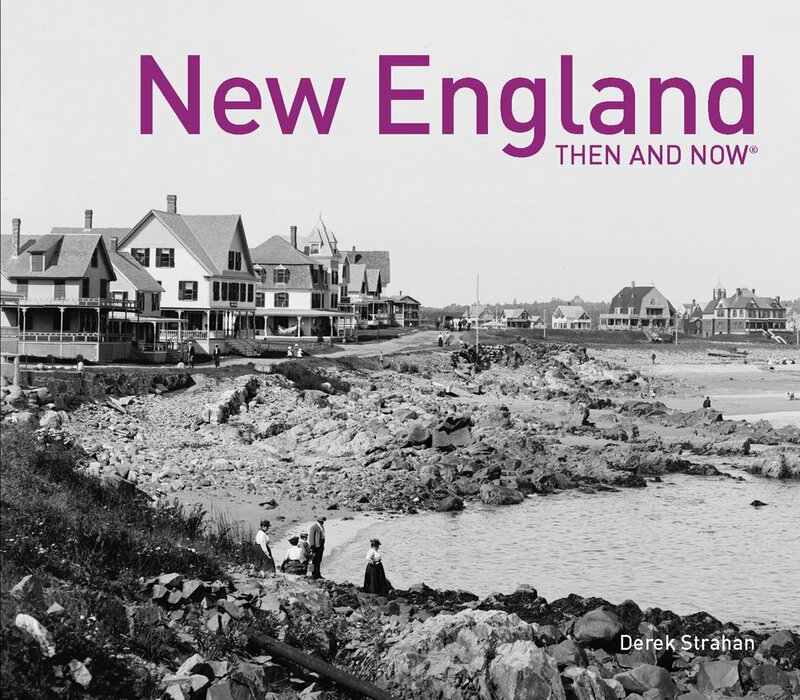 Its replacement was completed in 1910 on the same spot, and it stood here until it was demolished in 1968 to build the 27-story hotel that now stands here. Today, the only thing left from the first photo is Portsmouth Square itself, which is a major focal point within the city’s Chinatown neighborhood.